Downton Abbey returned to the USA this week with Season 5. (Oh, and if you’re in the UK, no spoilers please!) We love PBS’s highest-ever rated drama, and not just for its “intimately interlaced stories,” as PBS puts it. Though we do enjoy Maggie Smith as the Dowager Countess, our favorite character is the highly ornamented Downton Abbey itself. Of course, Downton Abbey itself is about as real as the Dowager Countess. What you’re seeing when the Crawley’s labrador runs across the lawn during the opening credits or when Thomas sneers across a highly decorated library is a 17th-century Jacobean-style country house called Highclere Castle. It sits on a 5,000- acre estate in Hampshire in the south of England, where it remains the seat of the Earl of Carnarvon. Highclere Castle’s oak staircase, as featured in the PBS drama, Downton Abbey. Highclere Castle’s interior serves as an dramatic backdrop to the show. The main oak staircase, for example, was the scene of Lady Mary Crawley’s big wedding gown reveal at the beginning of Season 3. 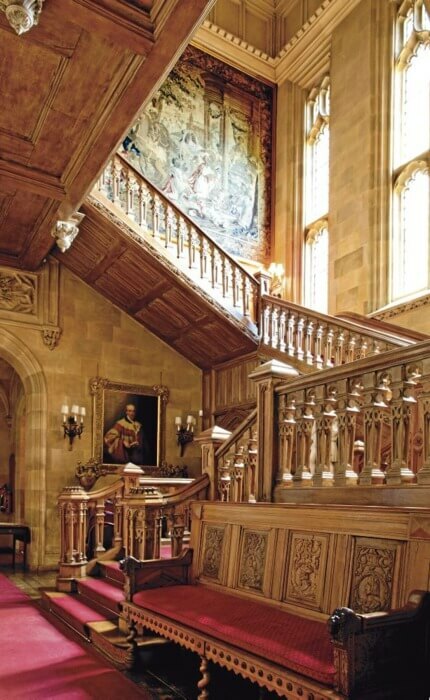 According to Highclere Castle’s website, Messrs Cox and Son of London built the original staircase, which was finished in 1862 after almost a year of carving and installation. Interestingly, if you wanted the same staircase today, it would probably take about the same amount of time—if done properly. That means using the same hand-carving tools and techniques that Cox and Son employed 150 years ago. But at what cost? Looking at Google images from the show, company CEO Ian Agrell did his best to come up with a ballpark figure. (These aren’t binding numbers, says our lawyer.) 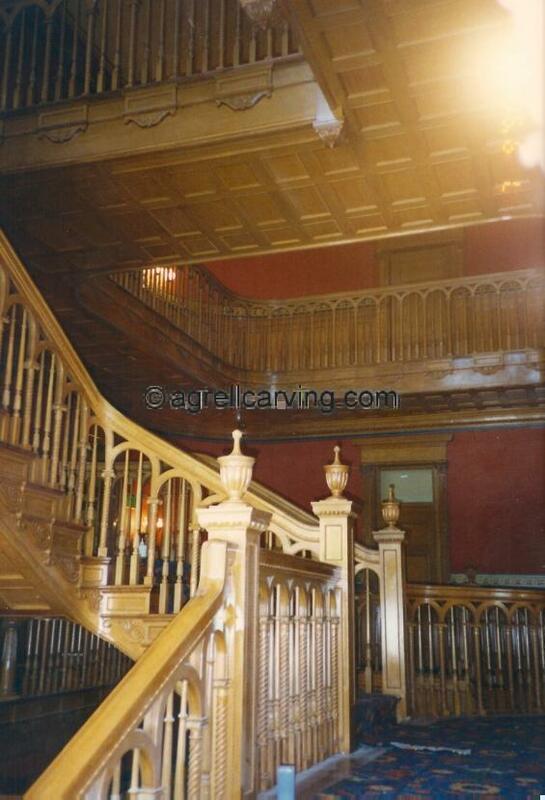 We’ve carved and installed similar staircases, including one for the Utah governor’s mansion in Salt Lake City. Ka-ching! That’s another 500 hours. “And, at my best guess, 12 landing newel posts at 150 hours a piece,” Ian says, adding another 1800 hours to the project. It’s worth adding that there are very few woodcarving workshops around today that can provide that many carving hours for a single project. Messrs Cox and Son may have had 20 or more working on Highclere Castle’s staircase—in fact, they almost certainly did if they were able to carve and install the staircase within a year. We could match that output. We employ around 20 classically trained woodcarvers and are always ready to take on a project like this. Want a Downton Abbey staircase? Here’s where you start.